Push notifications help keep the Android app connected during periods of bad connectivity and preserve battery life by allowing the application to alert you to important chat events without remaining continuously connected. While we recommend using them if at all possible, push notifications aren't supported in certain regions, like China. If you're using the app in one of these regions, you'll need to disable push notifications in order to receive notifications when the app is in the background. Of course, this means the app will remain continuously connected and will drain your battery more quickly. For more details about battery use, see Optimizing battery life with the Zendesk Chat Android app. Tap Menu icon (≡) > Settings. Under Preferences, toggle the Push notifications option to off. A warning message appears confirming that you want to disable push notifications. Tap Disable to continue. 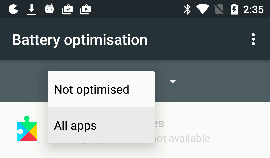 Note: If you're using Android 6.0+, the warning message might also prompt you to whitelist the app. See Whitelisting the Zendesk Chat app on your device below for details. 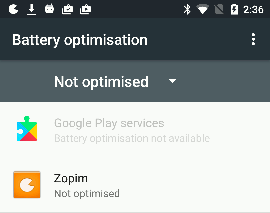 If you’re using a device on 6.0 Marshmallow or above, you have a feature called Doze that helps to improve the battery life of the device when it is idle or asleep. To avoid missing notifications when your device is in Doze mode, you need to whitelist the Zendesk Chat app in your device settings. At the top right, tap More ( ⋮). Tap the down arrow and select All apps. Tap on the Zendesk Chat app in the list. 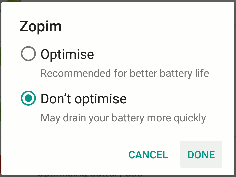 Select Don’t optimize and tap Done.